Powers/Abilities: Owl has repeatedly used a flight serum that allows him to glide on the winds, with the help of his specially designed cloak. Owl briefly used metallic enhancements, including three razor sharp talons on each hand and an exoskeleton to ally him mobility. His exoskeleton at the time raised his natural heart rate to hundreds of beats per minute and his body temperature to 113 degrees, while removing his body's ability to perspire. Owl had the vertebrae of his neck altered, allowing him to turn his head around a full 180 degrees. The serum caused Owl's eyes to move independently of each other for a time and caused his ears to atrophy, leaving only tiny aural openings. He started wearing a headpiece that allowed him natural hearing and eye sight, though his eyes could still move independently of each other. The flight serum, over time, hollowed out his bones, added air sacs to his lungs, gave his neck extra vertebrae, and heightened his perceptions. Owl briefly used leg braces to stabilize him during a time when he couldn't walk. Owl has a neurological pacemaker, which has been known to short-circuit in times of undue stress. Owl briefly utilized a mechanical armored hover-chair, which fired deadly lasers with precise accuracy. He has utilized different types of equipment, including armed lasers, armored walls, extreme cold guns, armored owl robots, blinding mists, electrical interference generators, devices that drain and subjects memories and upload them to another subject, poison-tipped rings, and three-dimensional projections of owls. Owl frequently establishes a well-equipped Aerie in remote places, keeping owls, apes, and other animals as needed, and placing strategic trapdoors, air current generators, and hanging cages (some with heating bars!) throughout. He has frequently led gangs of criminals, such as his Owl Gang, who sometimes dress up in owl-themed costumes, and often transports himself in an Owl-copter, private jets, submarines, and motor boats. Owl briefly downloaded surveillance and intelligence equipment directly into his brain interfaces, allowing him to access cell phones, cameras, and other electronic equipment through his brain. Weight: 200-220 lbs. ; (wearing braces) 240 lbs. 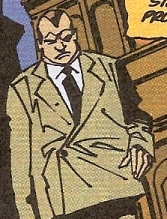 (Official Handbook of the Marvel Universe: Daredevil 2004) - Leland Owlsley was a prominent family man with a thriving business, focusing primarily on financing with philanthropic aspirations. (Spectacular Spider-Man II#219 (fb) - BTS) - As a corporate executive, Leland Owlsley frequently crossed paths with Paul Greyson, a business rival. (Daredevil I#302 (fb) - BTS) - Leland Owlsley tried acting as a community leader, even sponsoring a youth center. (Daredevil I#303 (fb) - BTS) - Early on in his career, Owlsley was approached by criminals and taught to money launder by adjusting numbers. (Daredevil I#3 (fb) - BTS) - Now embracing the life of crime he'd become proficient in, Owlsley started using the name Owl and became known for his financial prowess, dubbed the most ruthless financial wizard of all time by some. With no friends or family to speak of any longer, Owl set up accountant George Grey to take the fall if the tax authorities ever investigated. He constructed an elaborate Aerie over the Palisades cliffs, surrounding it with birds and filling it with traps. (Daredevil I#3) - Grey came to see Owl, begging Owl to prove him innocent, but Owl merely laughed and ordered Grey out. Overcome with emotion, Grey wandered out in front of a car and was killed, causing the authorities to become suspicious. They let Owl know he was under investigation and recommended he get a lawyer. He picked out the first firm he saw in the book and contacted Franklin "Foggy" Nelson and Matt Murdock. (Daredevil Yellow#3) - Owl went to their office to personally recruit them. (Daredevil I#3) - Murdock showed up at police headquarters and met Owl, who was ordered to return the next day for court, but Owl retreated to his Aerie instead. Resigned to live the life of a criminal now, Owl held auditions for his henchmen. He tested Sad Sam Simms gun talents in a duel with wax bullets, then watched Ape Horgon defeat an actual ape in combat, one that Owl had saved in a cage for him. Then, to demonstrate his own power, Owl sent the duo plummeting through a trap door, then swooped down to save them, lowering them to the ground. With his henchmen convinced of his power, Owl loaded them aboard his boat and took off for the city, determined to kidnap Murdock and keep him in Owl's service. At Murdock's office, they were attacked by Daredevil (secretly Murdock himself). Daredevil fought off Horgon and disarmed Simms just as Murdock's secretary Karen Page entered. (Daredevil Yellow#5) - Owl took her hostage and forced the hero to surrender, then returned them both to his Aerie and hung them in suspended cages. When Daredevil broke free and sought to free Karen, Owl swooped down on him, but Daredevil easily knocked him back. (Daredevil I#3) - Owl took her hostage and forced the hero to surrender, then returned them both to his Aerie and hung them in suspended cages. Owl ordered Simms and Horgon to contact the underworld leaders so that he could deliver Daredevil to them and become their overlord of crime. Daredevil and Page escaped and the hero fought Owl off while Page drove away from the Aerie to freedom. Owl leapt on Daredevil, who threw him to the ground. Owl then rushed up his staircase in the dark, then flattened the stairs behind him, sending Daredevil down into the water. Owl then noticed the police surrounding the Aerie. He glided down to his boat and tried escaping, but Daredevil turned his boat over. Owl escaped in the water as his henchmen and the other mobsters were arrested. (Black Bolt I#4 (fb) – BTS) – Early on in his criminal career, Owl employed Crusher Creel (the future Absorbing Man) as an enforcer. (Daredevil I#20 (fb) - BTS) - Owl was soon apprehended by the police and sentenced by Judge Lewis to prison. He soon got out and built himself a new Aerie on a small island, only reachable with his private jet. Seeking revenge on Lewis, he had his men kidnap the retired judge and sent them after Murdock, wanting to hold a mock trial at his Aerie. (Daredevil I#20) - Owl's men returned with Murdock and Owl announced his intentions, striking one of his men for questioning Owl's methods. Owl had Murdock and Lewis brought into the mock courtroom to meet the jury composed of ex-convicts, all of whom had a grudge against Lewis. The farcical trial commenced, Owl growing violent with his "jury" when they wanted to proceed with the execution immediately. Murdock, stalling for time, was allowed to roam the dangerous castle for five minutes, looking for a witness to testify for Lewis; Owl expected Murdock to fall to his death trying to run. Daredevil soon entered and attacked Owl's men. Owl dropped pool balls to trip Daredevil, then jumped up and released a cage, trapping the hero. (Daredevil I#21) - Using a pulley system, Owl lured Daredevil over a pit, then dropped out the bottom. When the hero held to the cage for his life, Owl pushed a button to heat up the bars, but Daredevil managed to escape using his billy club cable. Owl ordered his men to attack the hero again, but Daredevil used his cable to spin Owl around into his men, knocking them all down. As the island volcano began to erupt, Owl rushed to his forbidden chamber with Daredevil hot on his tail. He made it to his giant robotic owl and sent it against the hero, who narrowly evaded being slashed by its sharp talons. Owl continued controlling the robot until Daredevil destroyed the controls. As the castle started crashing down, the robot owl burst through the window with both Owl and Daredevil holding on to it. They tried to knock each other loose until Owl finally jumped free, planning to soar to the mainland. Daredevil, on the robot, grabbed Lewis to get him to safety. (Daredevil I#22) - In his emergency Aerie, the Owl activated a bomb within the robot, hoping to kill Daredevil and Lewis, but they escaped. (Daredevil I#80 (fb) - BTS) - Owl went to prison for a time, but he was eventually freed by Mister Kline, who put money into helping Owl restore his criminal organization, including a man named McGraw. Kline ordered Owl to apprehend Daredevil and Owl agreed. (Daredevil I#80) - As McGraw complained about how dark the room was, Owl lectured him on the importance of success. Kline then reminded Owl who was boss and Owl silently swore revenge on his ally. Owl designed a helicopter like an owl and descended in the city, scaring patrons such as Cleo and Johnny. Owl's men, including Cliff and Fritz, gassed the crowd, including Dickie, Hartford, Silvia, and Daredevil, then raided a department store. When Daredevil and the police attacked, the men fought their way free as Owl watched from afar. Daredevil followed the men up the rope ladder to the helicopter and Owl cut the ladder free. Daredevil still climbed aboard and traded blows with the Owl, but when the helicopter looked to crash, Owl flew free, leaving the hero to fall to his death. (Daredevil I#81) - As he landed on a nearby roof, Owl rejoiced as the helicopter exploded, thinking his foe dead. Kline upbraided Owl for trying to kill Daredevil, who was still alive, and terminated their partnership. Owl, frustrated, ordered his men out and reflected on how he was the only true genius. Owl and his men then broke into the treasury, but Black Widow attacked, kicking Owl in the face and beating back his men. Daredevil soon arrived as well and Owl was swiftly defeated. (Claws of the Cat#2 (fb) - BTS) - In Chicago, Owl appropriated a machine that recorded the brainwaves and knowledge of any human. He began kidnapping various professionals and holding their knowledge on tapes, which he planned to download into his own brain later. (Claws of the Cat#2) - Owl sent his owl-clad men to retrieve Joanne Tumolo, but they were attacked by the Cat (Greer Nelson). Owl, not wanting to risk exposure of his plot, ordered his men aboard the helicopter to shoot the men on the roof, horrifying the Cat. They later kidnapped Tumolo from the hospital and were followed by Nelson. Broussard took her captive as well, frustrating Owl. He explained his plan, then had Nelson locked up, but she quickly changed into the Cat and interrupted Tumolo's procedure. She nearly escaped with Tumolo in an ambulance, but Owl's men shot out the tires, then Owl attacked the Cat, leaping from the roof at her. Owl attacked the Cat directly, but she batted him aside and avoided his men's gunfire. Soon, the police surrounded the building and Owl rushed in to save as many files as he could. He instead found one of his men trying to download all the tapes into his own brain. The man fired a gun at Owl, hitting the machine and causing his own brain to overload. Owl tried escaping, the Cat attacked him on the roof. He jumped and glided to freedom. (Daredevil I#116 (fb) - BTS) - Owl set up a headquarters in San Francisco so that he could avoid super heroes. He set up a protection racket for local businesses, hiring men like Hackett to collect for him. He began wearing a ring that administered a poison to those it cut. (Daredevil I#116) - When Hackett got into a skirmish with Daredevil and the Black Widow, Owl had Hackett killed. Owl was furious to hear that Daredevil was in the city and vowed to kill him. He soon found the heroes and swooped down on them, ordering his men to hold their fire. He slashed Daredevil with his ring just before Black Widow knocked Owl down. Owl's men, in the copter, fired on Black Widow, grazing her skull with a bullet and knocking her out. Owl then took the unconscious Daredevil and Black Widow taken captive. 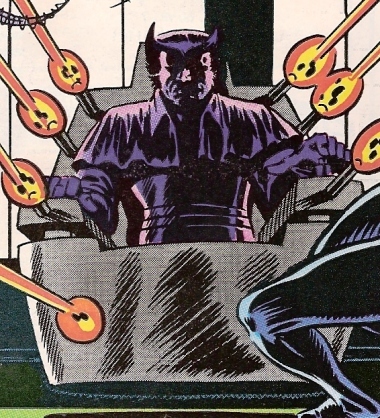 (Daredevil I#117) - With Black Widow in restraints, Owl put a machined cap on Daredevil, planning to steal his brain. He ordered Roscoe to start the absorption process, glorying that his nemesis would be dead within five minutes. Black Widow managed to break free, firing on the machine and Owl before defeating Owl's men. Owl held a gun to Daredevil's head, forcing her to surrender and ordering her to kidnap Shanna O'Hara for him in order to save Daredevil's life. Roscoe let Black Widow in later, with an unconscious Shanna. Shanna was taken by Roscoe to the machines while Black Widow was trapped in a net. When Shanna turned out to be feigning unconsciousness, she knocked out Roscoe and freed Daredevil. While Shanna and Black Widow fought Owl's men, Owl tried blinding Daredevil with a mist, not knowing the hero was already blind. 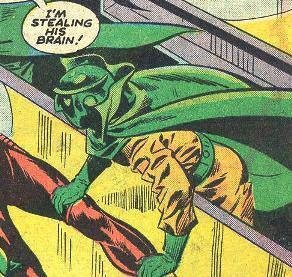 Daredevil hit Owl, who tried to escape on his preset purple escape ladder as he scrambled the hero's radar sense with electrical interference, but Daredevil still managed to apprehend Owl, who was soon arrested. (Black Widow: Deadly Origin#3 (fb) - BTS) - Owl and Mr. Hyde teamed up to rob a bank in San Francisco. (Daredevil I#144 (fb) - BTS) - Out of jail and no longer able to walk (due to his frequent use of the owl serum), Owl found himself fighting against rival gangs for criminal territory holdings. He sought a bodyguard to protect him. (Daredevil I#144) - Owl sent his men, aboard his copter, to retrieve Man-Bull from Ryker's Island. When Man-Bull arrived, a rival gang attacked, killing several of Owl's gang. Owl hid behind a protective screen while Man-Bull took down the other men, then invited Man-Bull to be his bodyguard. Owl's men, including Louie, fought the rival gang in the streets until Daredevil intervened. Man-Bull retrieved Professor Kerwin, an employee of the East Side Medical Research Center and an expert in using animal serums to improve human physiology, and returned him to the Owl. Man-Bull decided to seize power for himself, however, and knocked down Owl's men. Using crutches and without allies, the Owl escaped. (Daredevil I#145) - Owl, from another hidden lair, sent his men out to kill Daredevil, and one of them saw Fred nearly hit by a car. Feeling he had no other options, Owl took mechanical equipment he'd had developed and stormed the Upstate Medical Center in Poughkeepsie. He ordered Dr. Petrovic to perform a surgery, attaching the exo-skeleton and flying device to Owl's spine, and claimed that he could not be anesthetized as a bomb would go off if he was knocked unconscious. After the surgery was complete, Owl revealed the bomb was a hoax just as Daredevil attacked. When the police opened fire, Owl fled to get revenge on one of his gangster rivals. Trying to fly to his copter, he realized that Petrovic had sabotaged the equipment and Owl plunged into an icy river. (Superior Foes of Spider-Man#5 (fb)) - Owl and Man-Bull recruited safecracker Willie Valentine forcibly by taking his girlfriend hostage, but she ended up sleeping with Man-Bull. (Marvel Team-Up I#73 (fb) - BTS) - Since his braces broke his fall, Owl had time to signal his men in a nearby submarine before he fell unconscious. They managed to save him within seconds, though he was nearly frozen to death. Owl's men kidnapped Kerwin and forced him to nurse the Owl to recovery over the following months. (Marvel Team-Up I#73) - Choosing not to follow Kerwin's advice to convalesce longer, Owl returned to crime, watching his men rob a jewelry store through the cameras on their uniforms, and hoping to trap Daredevil. The men were rushing back to the helicopter when Daredevil and Spider-Man attacked, but the men managed to escape. Owl was pleased when the heroes followed the copter back to the headquarters, built into a cliff at the Jersey Palisades. He triggered a door that gave Spider-Man an electric shock, then opened the door and welcomed the heroes inside to face his traps. He attacked them with three-dimensional projections of owls, hoping to drive them mad, but only Spider-Man seemed affected. Daredevil led them through with no challenges. Owl set his men against the heroes, keeping Kerwin hostage as a back-up plan. When the heroes rushed in, Owl's men attacked en masse, though the heroes soon left them retreating. Owl demanded the heroes surrendered or Kerwin would be killed. The heroes feigned believing Kerwin was an ally of Owl's; when Kerwin perpetuated the lie, Owl's neurological pacemaker shorted out, leaving him in a coma. (Marvel Team-Up I#98 (fb) - BTS) - Owl soon awakened, but found himself unable to walk or fly. He gathered his men and had them appropriate him an armored hover-chair from the Maggia. Refusing to be in their debt, he planned to gather a small army of criminals, to attack the city, plunging it into blackness, and then to loot the entire city. (Civil War II: Amazing Spider-Man#2 (fb) - BTS) - At some point the Owl employed Clayton Cole (Clash) and Sully as henchmen. (Marvel Team-Up I#98) - While moving a drug shipment, Owl's operatives Trout, Cricket, and Sammy were discovered by Spider-Man, Black Widow, and Simon Stroud. Cricket blew up the building, seemingly killing the two heroes, and took the wounded Stroud captive back to Owl. That night, at Tom Stoneham's estate, Owl conducted the criminal meeting. When Spider-Man and Black Widow attacked, the army surrounded them and Owl revealed himself. He opened fire on the heroes until Spider-Man spun him around with a pulled web, disorienting him. His lasers drained, Owl tried to run for it, but Stroud shot the chair's exhaust fan, causing it to collapse into pieces, while Black Widow defeated the army. (Spectacular Spider-Man II#73 (fb) - BTS) - Owl learned to walk with braces and established a new base in a dinosaur museum. (Spectacular Spider-Man II#73) - Owl organized his gang and ordered Boomerang be brought to him. When his men failed because of Spider-Man, Owl, on a trapeze hanging from the ceiling and surrounded by stuffed birds, was furious that he wouldn't learn more of the Kingpin's operations. Dr. Octopus entered with his army, refusing a partnership with Owl, who leapt to the attack. Spider-Man intervened, fighting off the Owl and his gang while Octopus escaped. Owl chased Octopus through the museum until Spider-Man hit him, then Owl fled. (Spectacular Spider-Man II#74) - Owl sent his men to the Oppenheimer Atomic Research Lab to complete a heist, but the Octopus Gang was already there. Spider-Man broke up the fight as Owl flew down to steal the nuclear warhead he wanted to blackmail the city with. Owl escaped in his helicopter, but Octopus later attacked, revealing he had the device's activator. Owl still sought an alliance, but Octopus refused and tossed Owl aside angrily. Owl swore revenge. (Spectacular Spider-Man II#75) - Back in his Aerie, Owl was ruminating on his failure to retrieve the trigger when Octopus, with a captive Black Cat, and his army stormed the building from their submarine. As Owl's men fought the army, Owl moved into the dark parapets at the Aerie's top, where only he could see. He slashed Octopus twice, drawing blood on his back and arm ,then waited to strike again. When he saw the trigger falling, he rushed to grab it and Octopus ensnared him. He destroyed Owl's talons, cape, and leg braces, then let Owl fall several stories. Before defeating Octopus, Spider-Man noted Owl was barely alive. (Spectacular Spider-Man II#76 - BTS) - With their leaders defeated the gangs of Owl and Dr. Octopus joined forces to fight Spider-Man and Black Cat. (The Pulse#14 (fb)) - While on a high speed chase from the cops, Owl quickly hid his car in a warehouse with kids he called his own still in the back seat. Knightress, Power Man, and Iron Fist attacked and defeated Owl's gang. Owl slashed Knightress with a knife before she knocked him aside and Power Man knocked him out with a punch to the face. The kids were taken in by Social Services. (Spectacular Spider-Man II#127 (fb) - BTS) - Seeking to use the Lizard's formula to restore his ability to walk, the Owl kidnapped the Lizard's wife and son, Martha and Billy Connors. He ordered the Lizard to surrender the formula or his family would die, but the Lizard refused to comply and started questioning men on the street to track down the Owl. (Spectacular Spider-Man II#127) - Owl sent out two of his men, Vinnie Reese and Willie Cochrane, to set a trap for the Lizard. They were attacked and questioned and the Lizard learned the Owl's location. Owl heard the news about the men being badly injured, but he cared little. Lizard came in and watched Leroy holding the Connors' captive across the room. When Lizard refused to surrender, Owl had him blasted with extreme cold to knock him out, then Spider-Man arrived, grabbed the Connors, and tried to escape, but Owl blocked them with a steel wall. Owl ordered them killed, but the Lizard revived and attacked Owl's men. He then ripped out Owl's desk, and prepared to kill Owl, who begged for his life. Letting him live, the Lizard callously tossed him aside. (Daredevil I#264 (fb) - BTS) - Seeking to break in on New York's drug trade, make money, then get out, Owl studied the drug routes of the Cannibals gang. He hired the Bombers to intervene on those routes and switch their drugs with bombs! (Daredevil I#264) - After briefing the nonsensical Bombers on the plan, Owl tolerated their insults and leapt from the helicopter to impress them. Vowing to get revenge on the Bombers when the time was right, Owl landed in his headquarters and his pet owl lighted on his arm. He planned to use the money to build new wings that would directly attach to his skeleton. 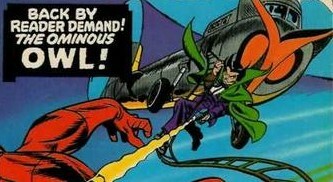 When Daredevil intervened on the Bombers' plot, Owl attacked him, slashing at him repeatedly with his claws and nearly defeating the hero until Daredevil managed to throw him on his back. Owl fired his claws at a pedestrian and escaped while Daredevil saved the man. (Alpha Flight I#79) - Influenced by Llan the Sorcerer, Owl flew to Winnipeg. (Alpha Flight I#80) - Alongside Nekra, Asp, and Scorpion, Owl was lured into a fight with members of Alpha Flight (Box (Madison Jeffries), Diamond Lil, Sasquatch (Walter Langkowski), Vindicator (Heather Hudson)) and Omega Flight (Auric, Nemesis (Amelia), Silver, Wild Child, Witchfire). Owl launched himself, claws extended, at Vindicator, who easily blasted him backward. Sasquatch then finished Owl and the fight was soon over. (Fantastic Four I#336) - Affected by Dr. Doom's emotion-enhancing machine, Whirlwind tried attacking the Fantastic Four (Human Torch (Johnny Storm), Invisible Woman, Mr. Fantastic, Ms. Marvel (Sharon Ventura), Thing) in Washington D.C. Owl awakened disoriented as he was arrested. Other villains present included Armadillo, Baron Brimstone, Man-Ape, Orka, Stilt-Man, and Whirlwind. (Daredevil I#303 (fb) - BTS) - In prison, Owl learned that the flight serum had, over time, hollowed out his bones, added air sacs to his lungs, given his neck extra vertebrae, and heightened his perceptions. Trying to embrace these changes, he shaved the center of his head to become more birdlike. (Daredevil I#301 (fb) - BTS) - Now completely dependent on technology to walk, fly, see, and hear, Owl's mutation continued further declining. His eyes started moving independently of each other, his ears atrophied, and his neck could now turn 180 degrees. Owl established a new Aerie in the partially completed Citicorp Center building, which was put on hold due to labor strikes. Owl gave Trainwreck Miller time to think over relinquishing his drug trade to the Owl. He gave a similar ultimatum to Nino Cortese. (Daredevil I#302 (fb) - BTS) - Owl started demanding payment from several other criminals and he began hoarding his riches in his Aerie. 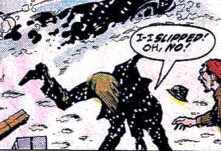 (Daredevil I#301) - Owl tracked down Trainwreck, who refused to concede, hitting Owl's metallic leg with a board. Owl flew after Trainwreck, impaling him with his metal talons and leaving him hanging from a ladder. Owl returned to his new Aerie, listening to Dixie Johnson on the radio while he killed a pigeon for lunch. Owl soon went to find Nino Cortese, who was being questioned by Daredevil. (Daredevil I#302) - Owl slashed at Daredevil repeatedly, but the hero still managed to save Cortese from Owl. Daredevil knocked Owl into a car, pinning his talons into the metal frame. Cortese soon took off in the car, dragging Owl on the street behind him until Owl managed to free himself. He climbed up the car to kill Cortese, but Daredevil caught up and knocked Owl to the street. Owl tried flying away, but Daredevil ensnared him with his billy club and knocked him into an electric sign. Daredevil climbed up and ripped the headpiece, causing Owl to cringe. Owl escaped while Daredevil rushed to save Cortese from his car wreck. He returned to his Aerie, overcome with fury at memories of his former life. (Daredevil I#303) - Owl tracked down Cortese again and ended up battling Daredevil, this time slashing the hero's abdomen. He tracked the wounded hero before a pack of rabid dogs shocking attacked him. Wounded, the Owl returned to his Aerie and started burning the memories of his past life. Daredevil followed him, encouraging Owl to try and seek true change in his life. As he thought it over, his cape started on fire and his mechanical legs started flailing out of control, leaving Owl to go falling over the edge. Daredevil narrowly saved Owl from death and promised to help him on the road to redemption. (Amazing Spider-Man I#396 (fb) - BTS) - After some time away, Owl returned to New York and heard about the Vulture's success in turning himself young. Not fully knowing why, he sought out the Vulture. (Amazing Spider-Man I#396) - Daredevil worked to track Owl down, roughing up criminal Wilson to do so and breaking his hand. Owl, meanwhile, sat high above the city, wondering to take the path as Owlsley or as the Owl. 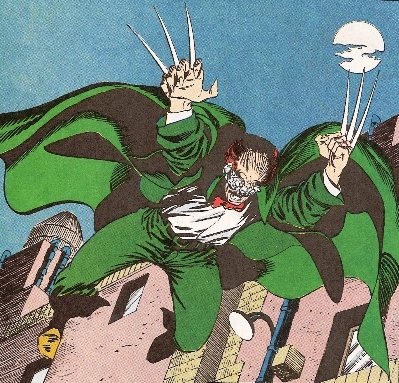 As he flew, he was surprised when the youthful Vulture (Adrian Toomes) sought him out for a partnership, yet chose to accompany him back to his headquarters. Vulture began taunting Owl about giving up his human past and embracing a life of crime. He injected a poison into a homeless man to prove his point, but broke the man's neck when Owl demanded the man be given the antidote, though Vulture claimed no antidote existed. When Vulture shared his plot to carry the poison through the city on trained birds of prey, Owl fled in horror, confused by his own identity. He was soon found by Daredevil and Spider-Man and Owl prepared to defend himself, but Spider-Man was infected by one of Vulture's birds. Owl rushed off, not telling them about the poison. (Spectacular Spider-Man II#219) - Owl flew overhead to see the poison's results and tried evading the armored Daredevil, explaining his bird's talons had been tipped with an experimental chemical virus. Vulture stopped Daredevil's club from hitting Owl and sicced his vultures on the heroes, but Spider-Man stopped them and the villains returned to Vulture's headquarters. Vulture confessed to Owl that he'd arranged for Paul Greyson to die, tossed the antidote to Owl, and allowed him the opportunity to choose between Owl or Owlsley once and for all. Owl watched Greyson die, remembering their past, then returned to the Vulture, prepared to embrace his criminal side. Spider-Man and Daredevil attacked anew and Owl fled rather than fight. He killed one of the Vulture's poisoned birds, tossed the antidote to Spider-Man, and escaped. (Daredevil/Spider-Man#3 (fb)) - In prison, Owl recruited Stilt-Man (Wilbur Day) to be his right hand man and to serve at his side when they got out. The two of them soon met up with the new Gladiator (Wylie Lemmick). The trio, under the guise of group therapy, began spending a lot of time together and planning future conquests, deciding they'd call themselves the Gang of Three. They eventually broke out of prison and united with Copperhead, calling themselves the Gang of Four and deciding to go after the Kingpin's territory. (Daredevil/Spider-Man#1 (fb) - BTS) - The Gang of Four started their war on the Kingpin's holdings. Stilt-Man hit a ship, stealing merchandise from it, and they attacked a restaurant and a warehouse that had Kingpin holdings. They also worked to recruit lower level criminals, such as Kenny Fitzgerald and Jack Abbott, into working for them as their reputation for ruthlessness grew. (Daredevil/Spider-Man#1) - As Stilt-Man worked on his stilts in a fowl mood, he expressed his frustration at not going after the Kingpin directly, threatening Gladiator when he tried to console him. Owl approached, admiring each of them for their potential for success and riches. That night, they attacked the Kingpin's building. The Owl, from his helicopter, fired missiles at the penthouse, hoping to kill the Kingpin and his men. (Daredevil/Spider-Man#2) - The Owl was furious to learn from the media that the Kingpin had somehow survived. Spider-Man (Peter Parker) and Daredevil (Matt Murdock) came looking for the Gang of Four in their underground hideout, but the heroes were taken down by a set explosion as the villains surrounded them. (Daredevil/Spider-Man#3) - As the villains battled the heroes, they were surrounded by the Kingpin and a group of armed men. Owl, whose speech was interrupted by frequent nikt sounds, leapt in a fury at Kingpin, but the men opened fire on him as he attacked. When the cops arrived, Owl attacked Spider-Man and Stilt-Man exploded the cop cars with his guns. Daredevil approached Copperhead, asking who had brought him back and how he was alive, so Copperhead pulled off his mask to show that he wasn't alive at all. (Daredevil/Spider-Man#4) - Copperhead invoked the name of his demonic master and trapped a three block section of New York under a mystic force field, calling it New Perdition. Copperhead unleashed zombies on Daredevil and Spider-Man. Soon, Daredevil held a gun to his head, willing to end his own life rather than let Copperhead make others suffer, but the Owl stopped him. Facing up to his own evil, Owl seemingly sacrificed his own soul to save Daredevil's. He knocked Copperhead through a portal back to hell and was taken with him. Stilt-Man and Gladiator fell to the floor and were presumably later arrested. (Thunderbolts I#53) - Owl was seen imprisoned in Seagate's super-villain cell block. (Daredevil: The Target#1) - When Owl tried robbing a bank, Daredevil easily defeated him. (Daredevil II#41 (fb) - BTS) - Vanessa Fisk refused to offer any portion of Kingpin's business to the Owl. (Daredevil II#45 (fb) - BTS) - Owl made a move on Kingpin's territory, making most of his profits by marketing MGH, Mutant Growth Hormone, which granted its users temporary powers. He had Doctor Sykes scrape his DNA to make the drug. (Daredevil II#41 (fb) - BTS) - Owl hired one of the Kingpin's former men, Cecil Anad, to provide counsel for him. (Daredevil II#41) - Owl was furious to learn that Daredevil was moving in on his drug trade, especially when he heard that Daredevil delivered the message "Gotcha last" before burning Owl's profits. Owl screamed his frustration to Anad, who ensured him that Daredevil, his identity questioned by the media, would not be able to act. Owl savagely attacked one of the henchmen Daredevil had robbed, shocking Anad. (Daredevil II#42) - As Anad tried lightening the mood with jokes, Owl shut him up and learned that Daredevil was on his way to see them. With recording devices set up, which they planned to use against Daredevil in court, Owl reluctantly agreed to remain calm. Daredevil burst his way in, threatening violence, knocking Anad aside, and breaking the camera, but Owl successfully remained calm. (Daredevil II#44) - Despite Anad's frustration, Owl ordered the word be put out that he'd beaten Murdock finally. (Daredevil II#45) - Sykes took another sample off of Owl, who blamed him for the last damaged shipment. As the FBI surrounded them, led by Special Agent Harold Driver, the Owl struggled to maintain his cool. He finally lashed out, grabbed the case of MGH, and rushed off as Anad screamed at him, but Daredevil met him outside and, easily evading Owl's savage slashes, punched him repeatedly, soon letting the FBI arrest him. (Daredevil II#47 - BTS) - Sano Orii made a play for the organized crime rule in the Hell's Kitchen area. He and his men slaughtered several of the Owl's men before Typhoid Mary attacked them. (Marvel Knights Spider-Man#9 (fb) - BTS) - Norman Osborn supported Owl's rise to power. (Marvel Knights Spider Man#3 (fb) - BTS) - Seeking to collect an old debt of the Kingpin's, Owl commissioned Vulture (no longer young) and Electro to retrieve twenty million dollars. The villains chose to steal the money for themselves, however. (Marvel Knights Spider-Man#2) - Spider-Man fought his way into Owl's penthouse to ask him for information. Owl remained calm and claimed legitimacy as Spider-Man demanded information on the kidnapping of May Parker. He then sent Spider-Man after Electro and the Vulture, claiming they were behind it. (Marvel Knights Spider-Man#4 (fb) - BTS) - Owl hired the Black Cat to go after the duo. She tracked them to Florida, but they eluded her. (Marvel Knights Spider-Man#2) - Spider-Man broke into the Owl's place and defeated his bodyguards, though Owl stayed calm drinking wine. Spider-Man demanded to know the location of elderly kidnapped May Parker, and promised to owe the Owl one. After leaving the room to make a phone call, Owl informed the hero that Electro and the Vulture were behind it . (Marvel Knights Spider-Man#4) - After battles with Spider-Man, Electro and the Vulture were easily captured and brought in. Owl had his aide Dr. Winkler scar Vulture. When Electro awakened with a paralyzer in his veins, he begged for release, but Winkler began working on him anyway. (Marvel Knights Spider-Man#6) - Owl attended the auction of the Venom suit, held by Eddie Brock. (Marvel Knights Spider-Man#13 (fb) - BTS) - Owl hired a female assassin that had been trained by the Hand. (Marvel Knights Spider-Man#13) - The assassin brought Absorbing Man to Owl, who offered Absorbing Man as many drugs as he wanted if he killed a list of people (including Daredevil, Punisher and some criminals) within 72 hours. Owl made it clear that if Absorbing Man failed the punishment would be severe. Absorbing Man took the offer. (Marvel Knights Spider-Man#14 - BTS) - With the assassin working as his handler, Absorbing Man started his hits on the gangsters on Owl's list. After a run-in with Spider-Man and Ethen Edwards, Absorbing Man hid out at a club. The assassin thanked the owner in Owl's name when she picked up Absorbing Man. (Marvel Knights Spider-Man#15) - The assassin informed Owl on the phone that they had failed to get Spider-Man, but that they were now on the way to Matt Murdock (Daredevil). (Marvel Knights Spider-Man#16) - Owl met with the assassin and asked her why they had failed to kill the targets within two days. The assassin still wanted to finish the assigment, but Owl stopped her because most targets had gone undercover and Absorbing Man and the assassin had drawn too much attention to them including the Punisher and Spider-Man. Defending herself, the assassin told Owl that Absorbing Man's unprofessional behaviour caused them to fail. Thinking for a moment what they could do with an addict like Absorbing Man, Owl ordered the assassin to give Absorbing Man his drug (cocaine). Absorbing Man turned himself into the drug and was packed up by Owl's men. Owl planned to sell Absorbing Man as drug to finance his gang war. (Marvel Knights Spider-Man#17) - Addicts taking the Absorbing Man-drug started to get his powers for around one hour. The assassin informed Owl, but he was delighted because the drug sold like crazy. Spider-Man tracked down Owl and was ready to fight him. Meanwhile Absorbing Man reassembled himself in the sewers and wanted to kill everybody. (Marvel Knights Spider-Man#18) - Owl and the assassin fought Spider-Man when suddenly Absorbing Man broke through the wall. He killed the assassin and then went after Owl, who escaped. Owl then tried to get some help against Absorbing Man, but Tombstone declined the offer and Bullseye couldn't be reached. Owl was shocked that despite all the money he had made he couldn't buy proper protection. Owl decided turn in state's evidence and surrender to SHIELD. Spider-Man fought Absorbing Man while Maria Hill picked up Owl with a helicopter. (Spider-Man: Breakout#2 (fb) - BTS) - When the U-Foes and Crossfire's gang started a turf war in his area, Owl's profits went down. He was contacted by Black Cat, who told him Spider-Man wanted information to take the criminals down. (Spider-Man: Breakout#2) - Owl willingly gave Spider-Man information on Rozalyn Backus, a guard who'd played the villians, to help him stop the turf war. (Toxin#3 - BTS) - The Answer began to rob banks with Sidekick in order to impress the Owl, the current ruler of New York's underworld. He managed to get the Owl's attention, and was waiting in a bar with Sidekick before phoning him back, but was confronted by Toxin. (Underworld#1 (fb) - BTS) - Owl began recruiting villainous talent to work for him. Most of them were given improvements by the Consultant. His main enforcer was the super-strong Mr. Pain (Vincent Dio). 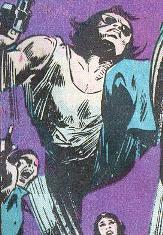 (Underworld#1) - When Jackie Dio, who possessed no super powers, sought a job with Owl, he had Mr. Pain find a job for him, not knowing Pain and Dio had history. 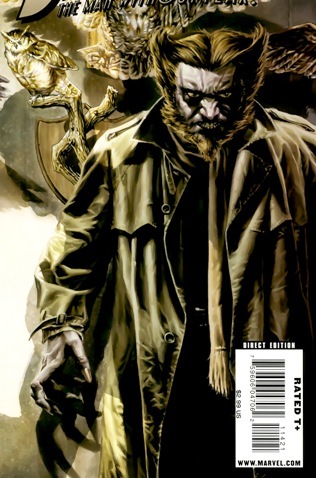 (Underworld#2 - BTS) - Pain left Dio for dead, so Dio, supported by the Consultant, began sabotaging Owl's operations. (Underworld#3 - BTS) - Dio defeated Pain's operatives, Grizzly and Boomerang. (Underworld#4) - Owl threatened Pain's job if he didn't stop Dio. (Underworld#5) - After defeating more of Pain's operatives, Dio met with Owl, who proposed a job for Dio (who soon began calling himself Underworld), but Pain attacked, knocking Owl out and fighting Dio, who departed after Pain was killed. (Daredevil II#80 - BTS) - Owl was caught and sent to Ryker's Island. (Daredevil II#82 - BTS) - He soon found followers and became one of the prison's leading figures. (Daredevil II#80) - He laughed when he learned of Murdock's arrest. (Daredevil II#81) - Owl mocked Kingpin when he was put into a cell nearby him. (Daredevil II#83) - Murdock, incarcerated for being Daredevil in Ryker's, was moved into general population. Owl entered his cell to taunt him and Murdock punched him repeatedly, knocking him down and breaking bones. (Daredevil II#84 - BTS) - Owl recovered in Ryker's as word of his injuries got out. (New X-Men II#35) - When X-23 (a former assassin of the Kingpin's) and Hellion came asking for help, Owl laughed at the irony, demanding the mutants be killed when they disrespected him. Hellion wrapped Owl in a telekinetic bubble and threatened to kill him unless Owl revealed where the Facility was stationed. (New Avengers#33 (fb) - BTS) - Owl got released from jail and rented a truck. He killed four SHIELD agents to get the valuable Deathlok armor, which he planned to sell to the highest bidder. (New Avengers#35 - BTS) - Chemistro informed the Hood about the Owl's plans to sell a new Deathlok cyborg. (New Avengers#33) - Owl met with Madame Masque, Crimson Cowl, Jonas Harrow, and the Wizard, who all had guns drawn and were all suspicious about the meeting being an FBI sting. Owl bluffed that having contracts on each of them if he didn't report to his allies in 24 hours, then unveiled the Deathlok robot, demonstrating its accessibility and helping them realize the potential. John King entered and stated Owl had no authorization to hold the meeting, then the Hood teleported in and shot Owl through the middle several times. (Daredevil II#118 (fb) - BTS) - After weeks in the hospital, Owl was taken to a court hearing. (Daredevil II#118) - As the guards, including Jeff, took Owl back to the transport van, they taunted him, promising him a beating. Suddenly, a wall blew up and Owl was freed by mysterious parties. He took time to slash and beat the guards before he departed. Owl wondered if they had been sent by Springer, but he was soon taken to the Kingpin, who offered him a job. Owl accepted and put out word over the city that he wanted to meet with Lady Bullseye and the Hand. They finally approached him on a rooftop and surrounded him, and Owl hastily informed them that he wanted to hire them. He promised to pay them handsomely if they killed his opponents on his rise to power. (Daredevil II#119 (fb) - BTS) - In the following days, Owl had criminal heads Alfredo Guerro, Max Sharp, and Miranda Lavender killed by the Hand in violent ways. (Daredevil II#119) - Owl reported back to Kingpin, shown in by Turk Barrett, and informed him that the meeting with Lady Bullseye was set and the trap was sprung. He grew defensive, then confused, at Fisk's final orders. Owl soon handed Fisk's last target over to Lady Bullseye, who laughed and sent her operatives White Tiger and Black Tarantula after the target. Lady Bullseye casually informed Owl that all the men Fisk had stationed around him were dead. She drew a sword and ordered Owl to take her back to Fisk. He waited during their meeting and swooped down to knock Dakota North unconscious when she was caught spying on them. (Daredevil I#500) - Owl savagely struck the unconscious Dakota to wake her up and promised to continue hurting her so he could get proper revenge on Daredevil. As Owl yelled at the operatives that he was in charge and he prepared to really hurt Dakota, Daredevil and Master Izo attacked. Owl, shocked, threatened to tear Dakota's throat out, but Master Izo threw a sword through his shoulder. Dakota kicked him backward and ran for it. Extending his talons from his forearms, but Daredevil, using a sword, savagely severed many of the Owl's nerve endings, leaving Leland moaning on the floor and unable to move. (Daredevil I#502) - While recuperating at Doctor Parker's clinic, Owl was approached by his men, Dennison, Mosley, and Todd, who laughed about him being paralyzed, ridiculed his status, and threatened to take over his empire. Owl screamed at them as they moved to feed him a mouse. He was not aware that his men had sold out to the Kingpin. Dennison was later beheaded for confronting the Kingpin. (Amazing Spider-Man I#618 (fb) - BTS) - Members of the Owl's gang got into a gang war with the Maggia at a scrap yard. During the fight, while Hammerhead shot at the gang, Silvermane was fed into a metal crusher. (Avengers: The Initiative#32 (fb)) - At times throughout his career, Owl has hired trained men from the Taskmaster to be part of his gang. (Amazing Spider-Man Presents: Jackpot#2 (fb) - BTS) - Owl purchased one of Corruptor's sweat glands and planned to synthesize it into a street drug, but Daredevil stopped him and stole the sweat gland instead. (Punisher VI#5 (fb) – BTS) – After Creel and his men were murdered, their allies wondered if the Owl was behind it. (Hawkeye IV#2) - Owl attended a circus alongside other criminals (Kingpin, Madame Masque, Tombstone, Hammerhead) and his money was stolen by Hawkeye. (Hawkeye IV#8) - Owl sat among the criminal underworld heads (Kingpin, Hammerhead, Madame Masque, Maggia, Mr. Negative, Ringmaster, Tombstone, Typhoid Mary) hearing a bid from the Russian mafia to kill Hawkeye. (Superior Spider-Man#10) - Owl tried moving his drug trade into the territory of the new White Dragon. The two gangs fought, but Spider-Man (Otto Octavius) savagely beat both men, especially the Owl (based on their past history) and left them for the police. (Superior Foes of Spider-Man#3 (fb)) - After Silvermane's robotic body was destroyed, rumors circulated that Owl had kept it captive Boomerang worked for Owl as a lieutenant for a time, and Owl confided in him about secret treasures. (Superior Foes of Spider-Man#5) - When Tommy double-crossed Owl, Owl fed him to the rats, then had his man Henry bring him rats to eat. 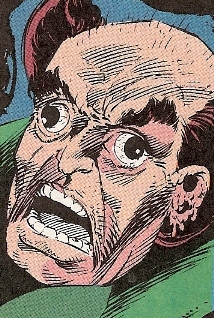 When the Sinister Six (Beetle, Boomerang, Overdrive, Speed Demon) attacked, fighting through giant scorpions, werewolves, armed guards, and ninjas, in order to retrieve Owl's secret treasure, a painting of the true face of Dr. Doom. Owl departed in his Prius with his ally Duncan. (Superior Foes of Spider-Man#6) - Owl and his men (including Terry) held Overdrive, Beetle, and Speed Demon captive, threatening to kill them unless they gave him Boomerang, but Beetle threatened him in return. Tombstone showed up to rescue her (having got a text) and was shocked to see Janice Lincoln, his daughter, there as Beetle. (Superior Foes of Spider-Man#8 - bts) - Tombstone freed the Sinister Six. Later, Owl sent a Bullseye LMD, commissioned by the Tinkerer, after Boomerang. (Superior Foes of Spider-Man#9) - After the Bullseye LMD restrained Boomerang, Owl (briefly with Tinkerer) questioned him and believed his story that the Chameleon had posed as Boomerang to steal the painting. Watching over camera, he saw Boomerang go to Chameleon's place and saw the painting inside. Furious, he sent the Bullseye LMD after them. (Superior Foes of Spider-Man#12) - Owl helped form the Sinister Sixteen, believing Boomerang's story that Chameleon was behind the heist of the painting. He sent the team to retrieve it. (Superior Foes of Spider-Man#13) - Owl was furious when Boomerang stole the painting again. (Superior Foes of Spider-Man#15) - Owl and Chameleon, after questioning Mirage, decided to team up to get back at Boomerang. (Superior Foes of Spider-Man#16) - Owl and Chameleon's men found Boomerang and started beating him up, not realizing it was actually MACH VII in disguise. (Superior Foes of Spider-Man#17) - Owl followed Boomerang to a baseball gang, where he was posing as Demang Pendak. He forced Boomerang to lose the game to settle their debts, having bet against him, and used Tinkerer designed LMDs to cover for him. (Hawkeye IV#22) - Owl and the underworld heads, including Derek Bishop, put a hit out on both Hawkeyes, Clint Barton and Kate Bishop. (Daredevil IV#15 (fb)) - Years ago, Owl had Jubula Pride, whose mother left. He had A.I.M. experiment on her and teach her technology so that she could fly with him. (Daredevil IV#2 - BTS) - Owl moved in on San Francisco, having a turf war with the Shroud, who kidnapped four of Owl's men: Lu, Heisserer, Arvino, and Boylan. (Daredevil IV#3) - Eli delivered the news to Owl about Shroud, that the kidnapped men had been branded with the Shroud's mark, and Owl attacked Eli. That night, Murdock visited Owl's estate, bypassing security, including Mr. Hobbins and Mr. Orlando, and then attacked with Shroud, but Owl convinced Shroud to join him by promising to reunite him with Julia Carpenter. (Daredevil IV#4) - Daredevil knocked out Owl's men, but Shroud escaped with Owl, disappearing in the shadows. Shroud tortured Owl, then took him to a tech company of Owl's, where information could be recorded and sent directly to the human brain. Daredevil intervened and sparred with Shroud while Owl uploaded the tech directly into his brain. (Daredevil IV#13) - Owl monitored electronics, keeping on eye on Daredevil and his new girlfriend Kirsten McDuffie, and he teamed up with the Shroud. (Daredevil IV#14) - In the subbasement of Alcatraz, Owl was wired into computers to monitor local events. The Owl's daughter, Jubula Pride, worked with Daredevil to find Owl, who was there with Shroud. (Daredevil IV#15) - Shroud used Owl's powers to expose many of Matt Murdock's secrets, putting him in danger. (Daredevil IV#18) - Jubula had Owl send messages publicly that would expose the Kingpin, then she freed Owl and took him into hiding. (Uncanny Avengers III#5) - Owl interacted among other criminals aboard the Queen Kathleen ship. (Civil War II: Kingpin#1/1) - Owl and Madame Masque refused an alliance with Kingpin, then Blue Marvel and S.H.I.E.L.D. arrived. (Daredevil V#9 - BTS) - Black Cat assembled intel on all criminal competition, including the Owl. (Civil War II: Kingpin#4) - Owl heard from jail that Kingpin had died. Owl later agreed to testify against him, but was stabbed in jail for his betrayal. (Kingpin II#3 (fb) - BTS) - Tombstone robbed the Owl and had two of his men killed. (America I#6) - Owl attended a boxing match at the Midas Coliseum in Las Vegas, hosted by Arcade and Mindless Ones, seeing Ms. America and La Sirena fight. (Jessica Jones I#18) – The Owl ran a club for super-villains. Jessica Jones sought him out, using intel from Raindrop Lilly, and found Armadillo, Tiger Shark, Quicksand, Bushmaster, Fera, Squid and others inside. (Daredevil I#598) - After Kingpin became the mayor of New York City, he had his man James Wesley offer the Owl the position of the head of the Department of Aging, and Owl accepted. (Daredevil I#600) - Owl, Black Cat, Diamondback, and Hammerhead met at Sarno's restaurant, where Spider-Man, Daredevil, Moon Knight, Jessica Jones, Luke Cage, Echo, and Iron Fist soon rushed in to fight them, then the police swarmed. Owl realized Kingpin had set them all up. All of the villains and heroes, except Daredevil, were arrested. (Daredevil I#602) - After Kingpin was badly wounded by the Hand, Matt Murdock became the interim mayor, and he offered to let Owl and the others out of jail if they agreed to use their armies and influence to fight the Hand. Comments: Created by Stan Lee, Joe Orlando & Vince Colletta. The identity of the Deathlok the Owl tried to sell is unrevealed. It could've been Deathlok's Exact Medical Replica. It is very unlikely that it was the original Deathlok from Earth-7484. Owl may have been presents at the Scorpion suit's auction in Marvel Knights Spider-Man#12. The Owl is listed as Daredevil's sixth deadliest foe in Daredevil Annual I#8/2. Owl received entries in the Deluxe Edition, the Master Edition, and in the Daredevil 2004 special. Hackett's first name was revealed in Owl's OHOTMU A-Z HC#8 entry. Thanks to G Morrow for adding Thunderbolts I#53. Thanks to Michael Niosi for correcting Owl's appearance in Amazing Spider-Man: Jackpot#2. 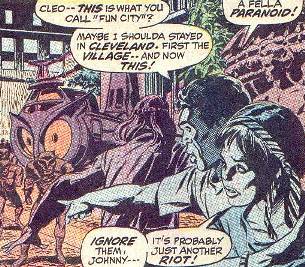 (Daredevil I#80) - Owl designed a helicopter like an owl and descended in the city, scaring patrons such as Cleo and Johnny. 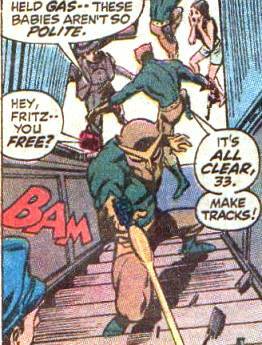 Owl's men, including Cliff and Fritz, gassed the crowd, including Dickie, Hartford, Silvia, and Daredevil, then raided a department store. (Daredevil I#145) - Owl, from another hidden lair, sent his men out to kill Daredevil, and one of them saw Fred nearly hit by a car. (Daredevil I#80 - BTS) - Gary, of WKBC News, recorded the helicopter footage between Owl and Daredevil. (Spectacular Spider-Man I#219 (fb) - BTS) - As a corporate executive, Leland Owlsley frequently crossed paths with Paul Greyson, a business rival. (Spectacular Spider-Man I#219) - Vulture confessed to Owl that he'd arranged for Paul Greyson to die due to a deadly poison, tossed the antidote to Owl, and allowed him the opportunity to choose between Owl or Owlsley once and for all. Owl watched Greyson die, remembering their past, then returned to the Vulture, prepared to embrace his criminal side. (Daredevil I#116 (fb) - BTS) - Owl set up a base in San Francisco and hired men, including Hackett, to collect for him. (Daredevil I#116) - Hackett and his partner got into a gun fight during a robbery in San Francisco when Daredevil attacked. Hackett grabbed a young girl as a hostage, but Black Widow saved her. Hackett retreated back to the Owl, who had his henchmen slay him for his failure. (Daredevil I#301 - BTS) - Dixie Johnson reported for New York Minute on the radio about the city's labor strikes. (Daredevil I#144) - Owl's men, including Louie, fought the rival gang in the streets until Daredevil intervened. (Daredevil I#80) - As McGraw complained about how dark the room was, Owl lectured him on the importance of success. Kline then reminded Owl who was boss and Owl silently swore revenge on his ally. Owl designed a helicopter like an owl and descended in the city, scaring patrons such as Cleo and Johnny. Owl's men, including Cliff and Fritz, gassed the crowd, including Dickie, Hartford, Silvia, and Daredevil, then raided a department store. (Daredevil I#117) - With Black Widow in restraints, Owl put a machined cap on Daredevil, planning to steal his brain. He ordered Roscoe to start the absorption process, glorying that his nemesis would be dead within five minutes. Black Widow managed to break free, firing on the machine and Owl before defeating Owl's men. 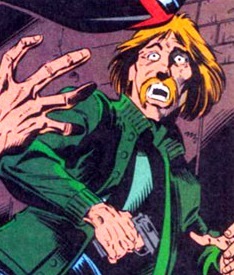 Owl held a gun to Daredevil's head, forcing her to surrender and ordering her to kidnap Shanna O'Hara for him in order to save Daredevil's life. Roscoe let Black Widow in later, with an unconscious Shanna. Shanna was taken by Roscoe to the machines while Black Widow was trapped in a net. When Shanna turned out to be feigning unconsciousness, she knocked out Roscoe and freed Daredevil. Owl was soon defeated. (Amazing Spider-Man I#396) - Daredevil worked to track Owl down, roughing up criminal Wilson to do so and breaking his hand.